Small volumes of anti-SEMA3F antibody vial(s) may occasionally become entrapped in the seal of the product vial during shipment and storage. If necessary, briefly centrifuge the vial on a tabletop centrifuge to dislodge any liquid in the container`s cap. Certain products may require to ship with dry ice and additional dry ice fee may apply. May play a role in cell motility and cell adhesion. 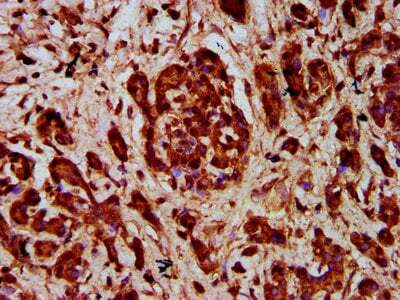 IHC image of MBS7109192 diluted at 1:400 and staining in paraffin-embedded human pancreatic cancer performed on a Leica BondTM system. After dewaxing and hydration, antigen retrieval was mediated by high pressure in a citrate buffer (pH 6.0). Section was blocked with 10% normal goat serum 30min at RT. Then primary antibody (1% BSA) was incubated at 4 degree C overnight. The primary is detected by a biotinylated secondary antibody and visualized using an HRP conjugated SP system. NCBI/Uniprot data below describe general gene information for SEMA3F. It may not necessarily be applicable to this product. 1. Semaphorin 3F placenta tissue expression was significantly reduced in preeclampsia. In addition, semaphorin 3F level at delivery was significantly lower in serum, amniotic fluid and venous umbilical blood of preeclamptic patients compared with normal pregnant women.